I was fortunate to have two work-free days at my disposal during my stay in Pohnpei, and I was not going to miss an opportunity for adventure in this wild paradise. 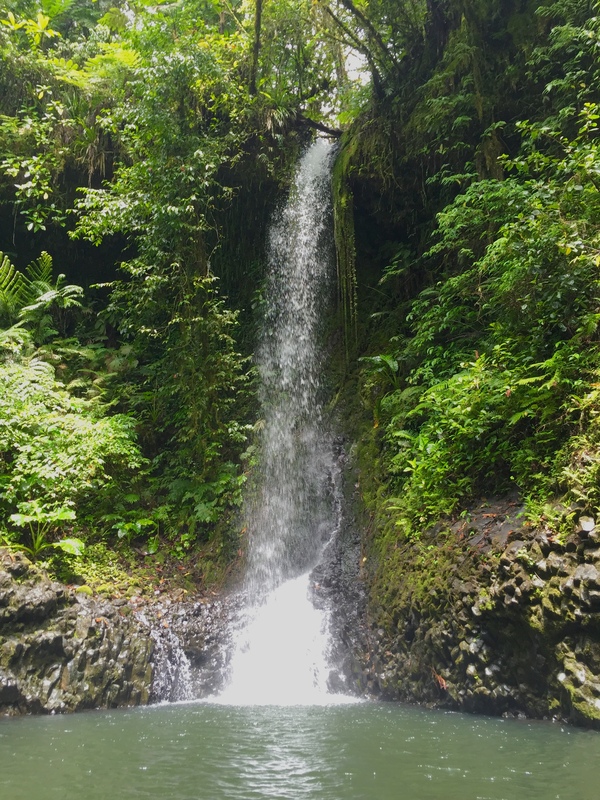 After extensive research I decided the Kitti 6 Waterfalls Hike would be my best option – it was billed as a full day hike and there were six waterfalls to see! Who wouldn’t want to do this hike? What wasn’t so obvious is just how absolutely grueling this hike is. That is to say, the majority of the 6 hour hike is spent climbing vertically up smooth, wet rocks/moss covered boulders/sheer walls of mangled tree roots, trudging through calf-deep, thick red muck, scrambling over wet basalt columns, wading across algae covered river rocks, steep vertical descents over smooth, wet rocks/moss covered boulders/mangled tree roots and muck, and at times swimming upstream in a river that runs between bat caves carved into ominous black basalt. Easy right? Needless to say, I was hopelessly unprepared for this hike. But I persevered, and at the end I felt an overwhelming sense of accomplishment. 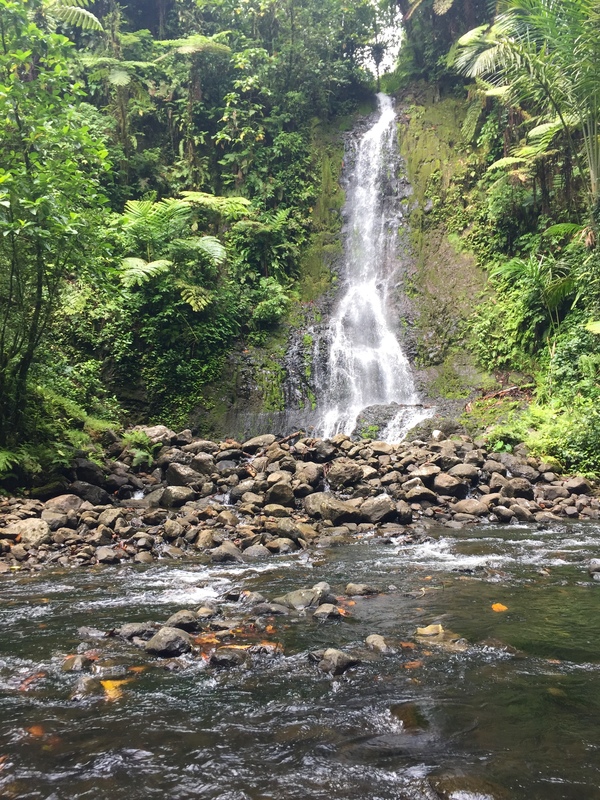 I did a lot of things wrong in preparation for this hike, so in retrospect here are my 7 tips for avoiding pain, injury, delirium and near death on the Kitti 6 Waterfalls hike. This should go without saying, I’m sure, but it was easily the biggest mistake I made. I started my day in flip-flops, but packed a pair of retired running shoes in my backpack just in case. All the hikes I had taken in FSM had to this point been pretty easy underfoot. Plus, I took a cue from my guide Relio who was wearing a cheap pair of flip-flops (“slippers” in FSM) himself. Certainly this hike couldn’t be all that difficult. Wrong. Halfway to the 1st waterfall, which I considered moderate difficulty at this point, I had to take off my flip-flops entirely. They were slipping, sliding and getting stuck in the red muck, and the vertical climbs up smooth, wet rock were nearly impossible with their traction, or lack thereof really. When Relio noticed I took them off he hooked them to his backpack and I forged on barefoot to Pahnairlap, the first waterfall. I took a much needed respite here with a dip in the cool green pool at the bottom of the fall. Relio probably mistook the pain and frustration on my face as disappointment, because he assured me the next one was his favorite and it was much better. After a few minutes he implored us to continue on. The next two falls, Nikotoapw and Olotong, occurred in rapid succession, but the terrain presented a new challenge to this barefoot beauty. We were now walking over algae-covered river rocks, mostly in knee-deep water. My bare feet were no longer capable of maintaining hold, so I was mostly ambling over the rocks on all fours like a mountain gorilla. I suddenly understood why our primate cousins never made it fully upright. They might be on to something after all. Relio, on the other hand, trudged on without so much as a slip the entire way. With the exception of one time when he was holding my hand across a river and I stumbled, pulling him partially over, I only saw him use his hands to balance maybe once or twice. I asked him how he managed, and he simply answered he had been doing this since he was a child. That answer was as good to me as “magic”. Often Relio would move along so swiftly he would disappear out of eyesight. He slowed down when he found me standing knee-deep in a river looking quizzically for him in the wrong direction. When we did have to ford the rivers he would wait to literally hold my hand, but as soon as we were on “dry land” he would take off. I wondered how much he hated me by the second waterfall. I decided at Nikotoapw that since flip-flops and bare feet had failed miserably, I may as well try my running shoes. They did provide a little more traction when walking in the river, but I found climbing up wet rocks and tree roots on the banks just as treacherous. I had to move with caution and use my hands to grasp on to moss or ferns when I could. Needless to say I ended up with very few photos of my journey, which is regrettable because the scenery was otherworldly in some parts. Chalk this one up in the vanity column. I was beginning to feel like I had packed on a few lbs. eating all the tuna the sea had to offer me the week prior. I decided I was going to trade in my chopped fish omelets for a small serving of yogurt and a piece of fruit in the mornings. I ate this a full hour before we even left for the hike, so by the time we took our first break I was already feeling a bit shaky. I devoured the one orange I brought, hoping it would sustain me the next 5 hours. At the fourth waterfall the pain from spraining my wrist during one of my falls was overriding my hunger pangs, but I gladly accepted the “lobster flavored” puffed rice crisps that Relio graciously offered me. They were mostly air and MSG, but I figured any carbs I could get at this point would help. 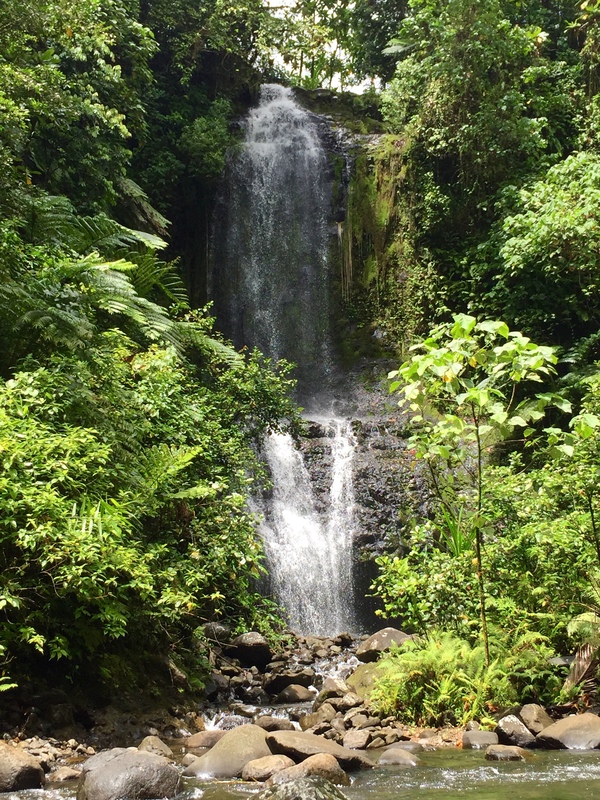 To boot, I brought only one bottle of water, which was gone by the third waterfall. 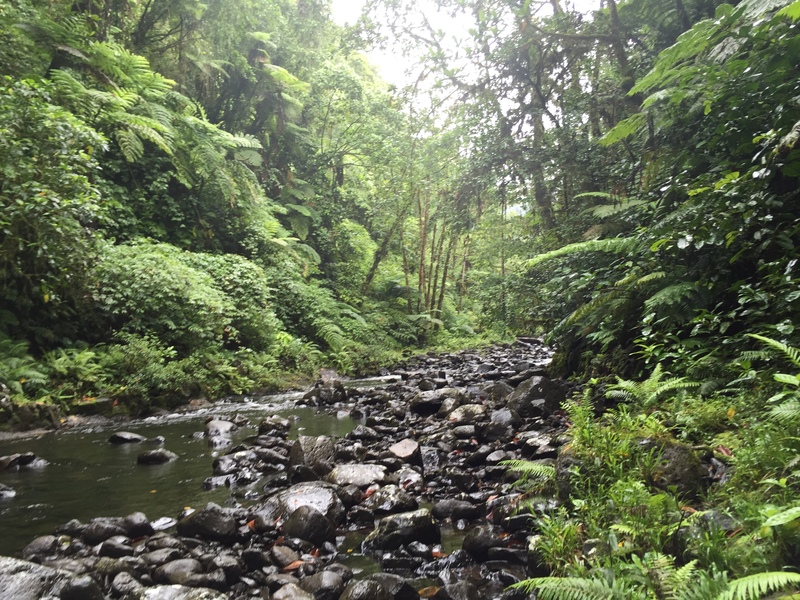 I considered bottling water from the river, which Relio told me had been tested and deemed safe by U. of Hawaii, but all my infectious disease public health lectures came flooding through my mind. I figured I was taking too much of a chance at getting parasites in my bare feet to also willingly drink some. I went thirsty the rest of the way, and by the end sheer exhaustion, hunger and thirst made even forming words a difficult task. I actually succeeded in this category, thanks to a last minute decision to throw a pair of light-weight running shorts in my bag. 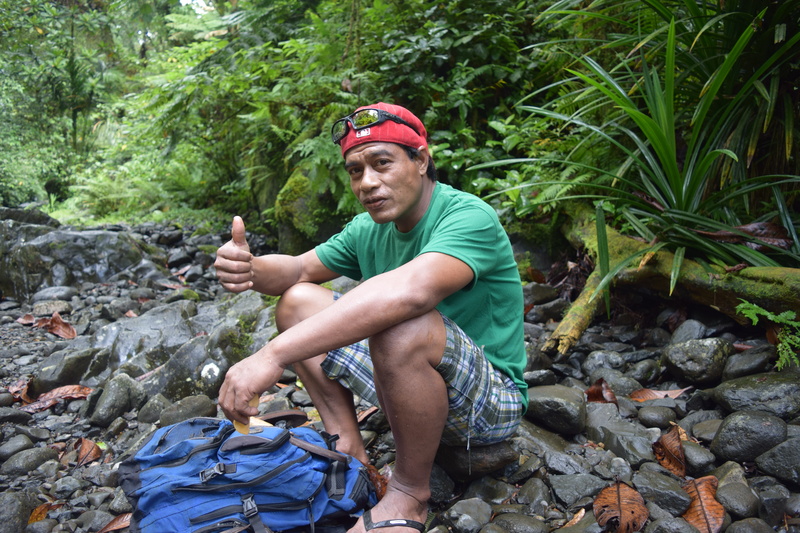 I had been wearing a pair of calf-length tech-material pants to respect cultural practices to the greatest extent I could, but after I swam in the first waterfall I decided to change into the shorts since they were easier to put on when wet. This was a good decision, because to access the sixth waterfall we had to swim upstream. One could just wear a bathing suit at this point, but if you do remained clothed you’ll want to be wearing something streamlined and non-absorbent. As a side note, I left my tennis shoes on while swimming, and was glad I did because they helped when fording the class 1 rapids and scrambling over soaking wet basalt columns. But, if you’re going to keep your shoes on, make sure they are lightweight enough to not drag you down in the river, which is swift-flowing nearer the mouth of the falls. Again I fared well in this department, though I would describe my backpack as water resistant since I did feel some dampness inside after the bottom had been submergd at one point when fording the river. Take as small of a pack as possible (you’ll want a snack, a water bottle, a rain jacket, a towel and a change of dry clothes for the ride home). Besides the multiple river crossings, it will rain during your hike. It just will. Be prepared. You can get there in a taxi, but if you don’t want to walk an additional 2-3 miles back to the village to find a taxi after your 5 hour, physically taxing hike, I would highly recommend having your own car. If you do walk back though, you will get a nice glimpse at village life, complete with naked toddlers wielding machetes. I consider myself to be in relatively good physical condition. However, I ran a half marathon three weekends before this hike and yet I found this marathon far more challenging. By the second waterfall my quads were shaking like I just left a crossfit box. Not to mention that thanks to a number of slips and falls thanks to my shoe gaffe, I ended the hike with a busted knee, a sprained wrist and more cuts and bruises than I could count. The swim to the sixth fall was actually the easiest and thus most enjoyable portion of the hike for me. But do note that the current is strong near the rocks, and even at the beginning when the current isn’t as strong you are still swimming upstream, so some swimming strength here is recommended. The hike begins near the Salapwuk Elementary school in the western Kitti municipality, about a 45 minute drive from Colonia. The “trail” is somewhat the shape of a tear drop, so you will begin and end on the same path. 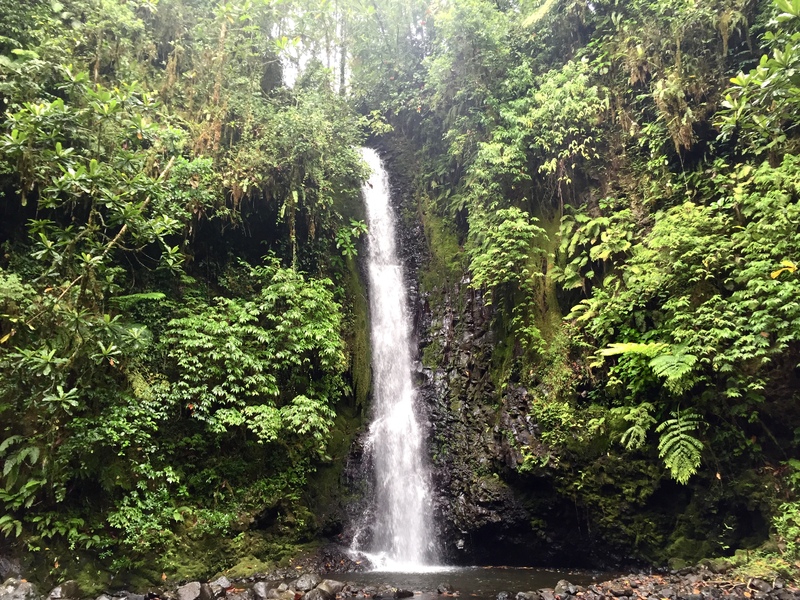 The waterfalls in order are named Pahnairlap, Nikotoawp, Olotong, Iro, Nan Emp and Lipwentiak. The portion of the hike to the first and second falls is probably the easiest, and it gets progressively more difficult after that. The last fall is by far the most impressive, but unfortunately I couldn’t get any photos of my own since my gear stayed on a pile of rocks downstream. You can jump off the vaguely heart-shaped cave mouth into a deep pool, provided you have feeling left in your extremities at this point. Oh, and the most difficult and dangerous part of the hike comes after the last fall. Just when you think you’ve experienced it all, you find yourself climbing moss-covered boulders on a nearly vertical slope. Don’t. Look. Down. If you are in need of a guide, either call or visit the 7 Stars Inn or email destinationspni@gmail.com for their preferred guide. Since I contacted him last minute he wasn’t available, but he contacted Relio for me who was available within the hour. The hike is tough (albeit easier if you are dressed appropriately), but so worth the pain. This is one of the most beautiful regions in Micronesia, and you absolutely can not experience without putting in a little effort, which makes it all the more worthwhile. 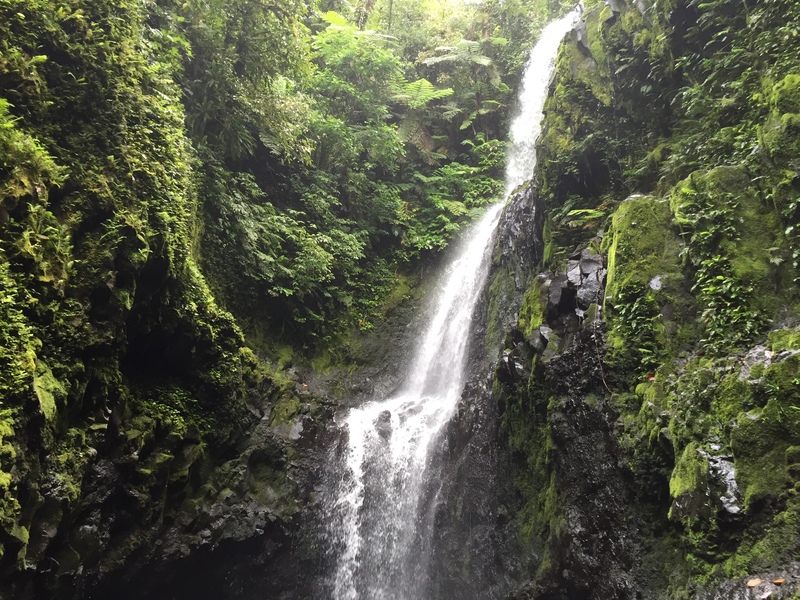 Would you do the Kitti 6 Waterfalls Hike? Leave a comment! I'm Tippins and, along with my husband the engineer, I travel the world via non-revenue pass travel. We are standby sojourners, and we invite you to follow us as we eat, drink, hike, dive and otherwise romp around the globe.